FALLSBURG, N.Y. (CNS) — At an upbeat Mass in a maximum security prison, Cardinal Timothy M. Dolan said Holy Week resonates with inmates, who can relate to Jesus’ arrest, captivity and trial. 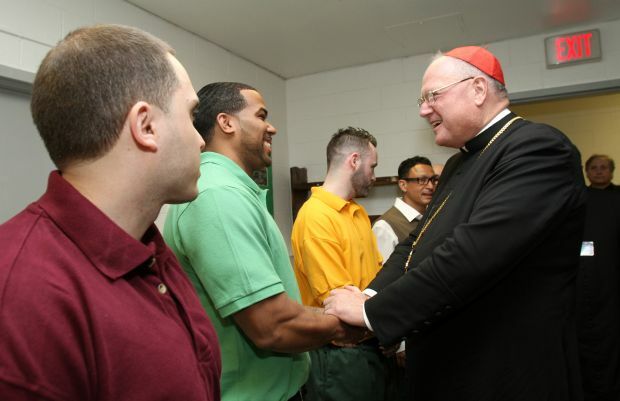 The archbishop of New York celebrated Mass April 14 for offenders, staff and visitors at the Sullivan Correctional Facility in Fallsburg. The state prison, 100 miles north of New York City, houses approximately 450 men. Most are serving life sentences for committing violent felonies. The hilltop facility is surrounded by tall chain-link fences, topped with concertina wire. “If you ever wonder, ‘Does God know what I’m going through? Has God forgotten me? Has God abandoned me?’ think of Jesus on the cross, who cried out, ‘My God, my God why have you abandoned me? '” Cardinal Dolan said in his homily. And if you think you don’t have any friends and you wonder why people are telling lies about you, think of Jesus on the night before he died, when his friends ran away and one sold him for money, the cardinal said. “If you’re fighting an addiction, if you’re craving a drink or drugs, think about Jesus on the cross, who said, ‘I thirst.’ Any time you feel dead or that you’d rather be dead, think of Jesus on the cross. He knows what you’re going through,” he said. “He died so we would no longer be prisoners in shackles and chains, but would be with him for all eternity,” he said. Inmates nodded their heads in assent when Cardinal Dolan said, “Never forget your buddy, St. Dismas,” the so-called good thief crucified with Jesus. Dismas acknowledged his own guilt and recognized Jesus as an innocent man and the savior. “Think of what Jesus felt when he finally found someone who trusted and believed in him. We know Dismas is there and he’s rooting for you guys. Don’t feel alone,” he said. Cardinal Dolan concelebrated the Mass with prison chaplain Holy Ghost Father Stanislaus Ogbonna and six other priests associated with prison ministry and local parishes. Two deacons assisted him. The altar servers, ushers, cantor, keyboardist and sacristan were inmates. Approximately 40 inmates joined an equal number of prison administrators, staff, guards and visitors at the cardinal’s Mass. Father Ogbonna said the local volunteers, including two women who sang for the Mass, “made the presence of the archdiocese permanent.” He told Catholic News Service there are more than 85 prisoners who identify themselves as Catholics. He has been the Catholic chaplain for 19 years. The cardinal joked that he likes prison Masses because the congregants “are the only people who never come late or leave early and you don’t care how long I preach!” His remarks were punctuated with applause. Bronx native Michael Lopez said the cardinal was “exceptional, charismatic and funny” and he was elated to participate in the visit, which he planned to describe in detail to his mother and two sisters. Lopez, who has been incarcerated at Sullivan Correctional Facility for 21 years, is eligible for parole in 2017. He serves as an usher and sacristan. Lopez said the concrete-block chapel room is shared with other denominations and he is one of several people who set up and remove Catholic religious paintings, statues and linen each week. He showed a reporter a tiny chapel where Mass is celebrated for 20-25 people four days a week. “It helps to keep us moving forward. People need to see we are still human. A man can lose everything, but as long as you are still capable of loving and forgiving, you’re still a human being, you’re alive and you have a soul,” Gonzalez said. Cardinal Dolan recognized Patrick J. Griffin, superintendent of the prison since 2011, and his staff. “I am always inspired by the people here. It’s more than a job and they take it very seriously,” he said. Griffin told CNS about 40 percent of the inmate population is sensorial-disabled, mentally ill or intellectually challenged, with an IQ at or below 70. Sensory disabilities include visual and hearing impairments. “We provide mental health services and also reasonable accommodation to the sensorial-disabled and legally blind,” he said.